The Great Library is a notorious example of Ionic architecture, though it was built at a time when many projects were "going covalent." The Great Library of Alexandria (or Royal Library of Alexandria) is the central book-loaning institution of Alexandria, Virginia. It is the most renowned such institution in the suburbs of the federal capital, and it contains the complete U.S. Code, the complete set of Federal Regulations (CFR), and, in the warehouse annex, the first two hundred volumes of the implementation of Obama-care. Construction of the original library was begun during the reign of Pharaoh Ptarmigan in 300, Before Christmas. Plutarch writes that Julius Caesar burned the library down by accident when trying to set fire to his ships, though the harbor is nowhere near the library. Happily, the stock of books, being engraved on stone tablets, survived this little mishap, and were in fact easier to read afterward. Later, the Arabs, not content to copy trivia like writing backwards from the Jews, copied Caesar and burned the Great Library again, probably for the offense of having books that were not all Korans. After mass borrowing of its books (and ignoring fines to return them), the Great Library was emptied of its contents. This became an opportune time to relocate it to Virginia. Unfortunately, in 1864, crying, "Third time's a charm," Civil War troops burned Alexandria. Only, it wasn't. The inventory at the Great Library contains quite a few originals, preserved expertly for most uses, except perhaps reading. All staff members of the Great Library have held Masters Degrees in Library Science, and some of them have actually earned them. The Great Library pioneered organizing the reference works under the Dewey Decimal System, a project that unfortunately had to be postponed for fourteen centuries to await the creation of the decimal system. Makeshift systems were used in the meantime. For example, reference works on HTML coding are conveniently found at Dewey key DCCLXXVIII. 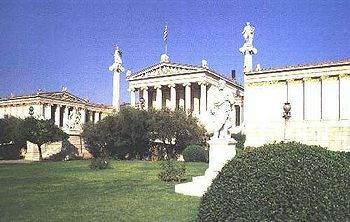 The editors at the Great Library were especially known for their work on the Homeric Texts. The more famous editors held the title of Head Cheese, while their subordinates and the scribes had to subsist on toe cheese. Many of the texts were taken from the ships that docked at Alexandria, the chief shallow-water port on the Potomac. The lowly scribes then swiftly copied these writings, some copies proving so precise that the library kept the stone-slab originals and delivered the parchment copies to the unsuspecting owners. The slabs were later used to pave the connector to the Washington, D.C. Beltway (I-495). They fit so tightly together that, to this day, weeds do not grow in the cracks, and have to live in one of the potholes instead. For those without comedic tastes, the "questionable parody" of this website called Wikipedia have an article very remotely related to Great Library of Alexandria. The Great Library is world-famous for its classic-styled reading room, an atrium decorated by hanging gardens, Egyptian sarcophagi, and statues brought from the original site. Virginia's homeless population sleeps comfortably on large beds of grape vines and parchment. The frequent urgings of the librarian to the vagabonds to "Shhhhh" are met equally, in the facility's acoustically perfect open-air dome, with catcalls and bird calls. Scrolls that turn to dust when touched line the walls of the rare book room, the reason the room is off-limits to all but thesis candidates and toddlers. But the rarer stone tablets, seen by appointment, consititute a treasure trove of ancient wisdom. The Moses Collection is famous by itself; the tablets with the Ten Commandments draw tourists from as far away as Leesburg. 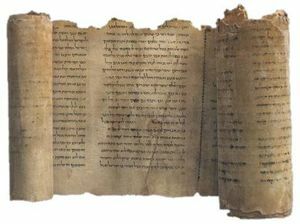 The collection also includes Moses' decree to Pharoah to "Let my people go," though an author at the last meeting of the Wednesday book club contended it is a grocery list that includes a note to the butcher to let Moses' slaves use the washroom. Other books packed in straw and flax in the rare book room are the Kitten Cookbook and its companion, the gold tablets which John Smith used to write the Book of Mormon - on display in a hat in the lobby - and the original handwritten manuscipts of Matthew and John's books (later published in a Mideastern bestseller) with margin notes indicating that Jesus and Mary de Magdelene eloped to Egypt in the mid-1st century, leaving everyone with egg on their face. Piri Reis maps showing the coastline of the Antarctic under the ice are also available to be viewed, but obviously no one takes them seriously. The Great Library includes several rooms that facilitate great meetings. They let the Community discuss issues and come together with one voice, which is usually that of the great librarian. Every October, these rooms are used for debates of local political candidates (or, as it is described to the one favoring lower spending on public works, "informal meet-and-greet sessions" that just happen to have podiums, timers, hecklers, and a stranger with handbills about the candidate's appearances in Family Court). The Great Library has always housed a zoo of exotic animals. Virginia strobe squirrels, Northern candy-shaped crocodiles, and a family of zzaardvarks roam freely atop and between the bookshelves. Patrons are asked not to feed the animals, although food dispensers lowered to children's height are filled with the creatures' favorite snacks. As asps and cobras prefer darkened corners, library personnel have easy access to snake-bite kits and reference materials relevant to potential emergencies. When a complete text was needed for scholarly research, more than one Bookmobile was sent. A modern Internet room contains state-of-the-art terminals so that patrons can perform on-line research. Unfortunately, the default search engine is still set to the Oracle at Delphi, and response time is slightly less than snappy. The Great Library supports a network of so-called Little Libraries, and a fleet of Bookmobiles, to diffuse the joy of reading into the residential neighborhoods of Alexandria and throughout eastern Fairfax County. A typical Bookmobile contains enough stone tablets to hold perhaps two entire pages of one of the Great Classics, and requires only a half-dozen couriers to transport it from place to place.